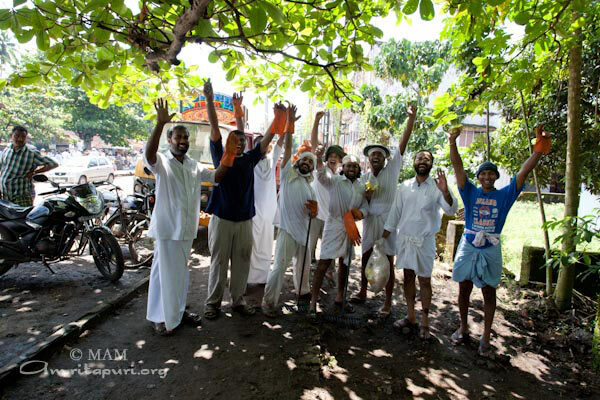 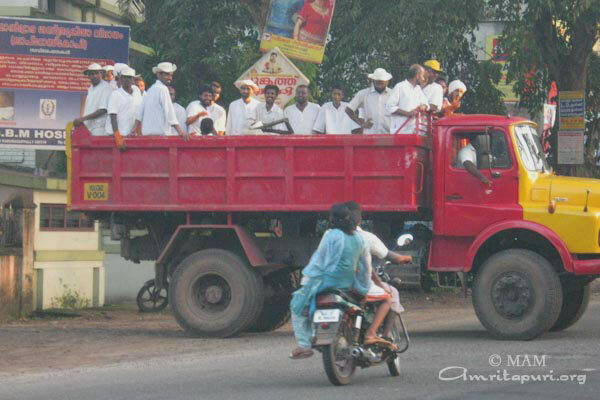 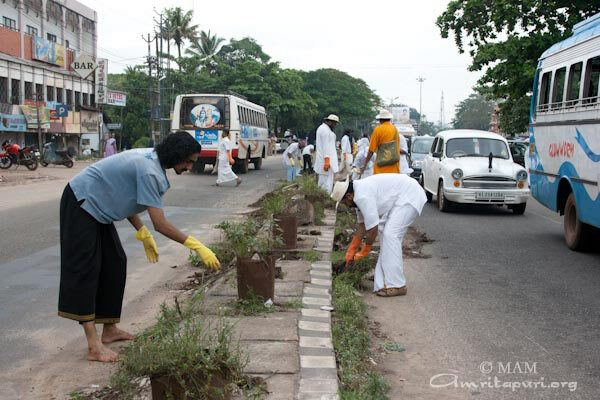 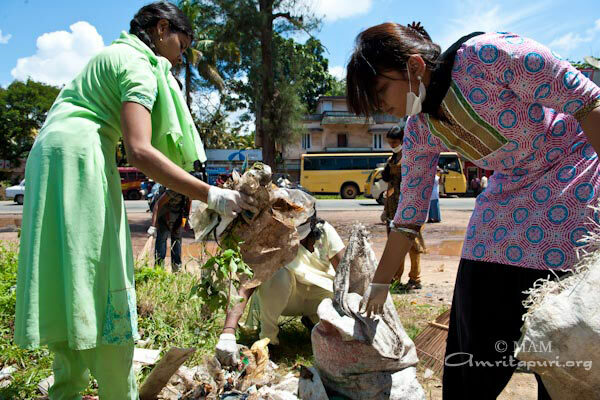 Nearly 500 people, including brahmacharis, students of Amrita University and devotees participated in the dawn to dusk cleanup drive on National Highway 47 in Karunagappally town. 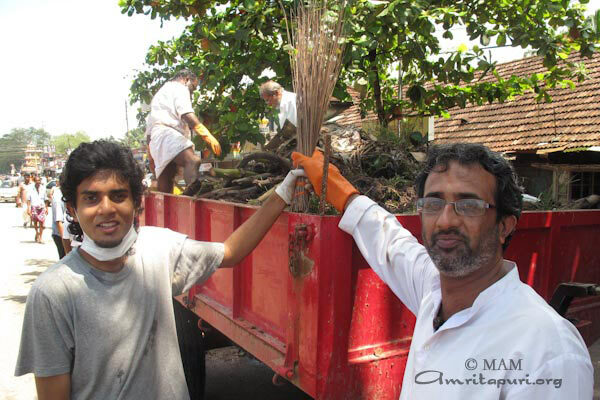 The drive started at 9.00 am and lasted till 6.00 pm covering a distance of 2 kms from Govt. 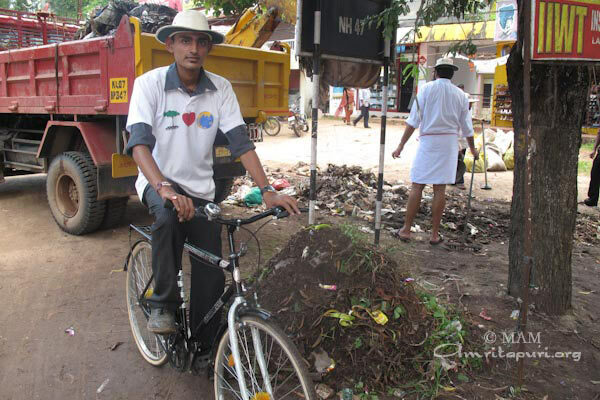 Taluk Hospital to Lalaji Junction. 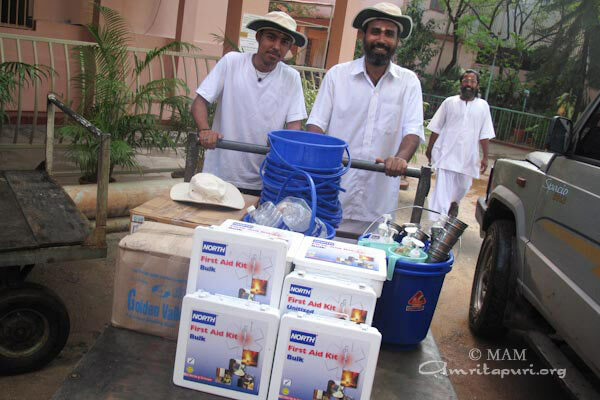 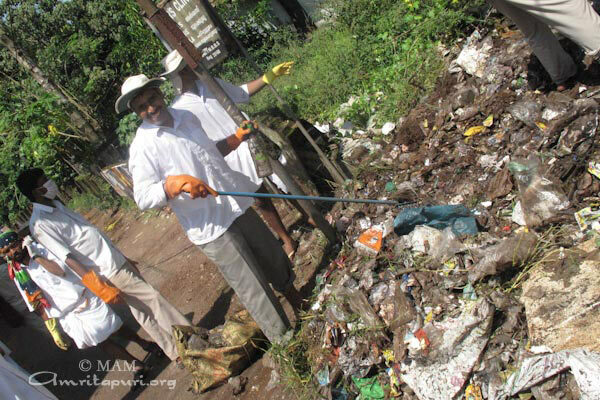 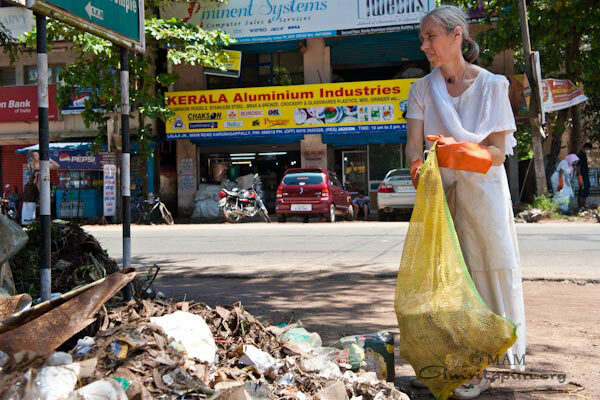 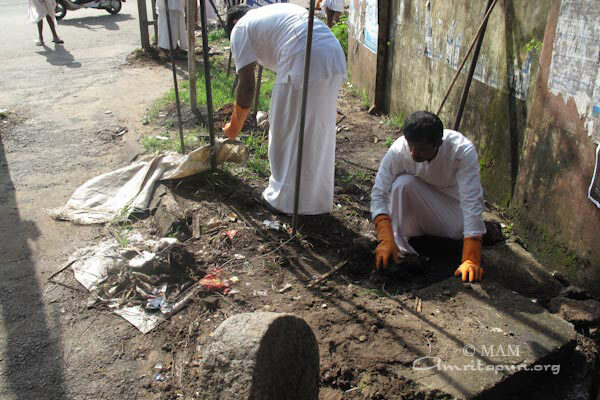 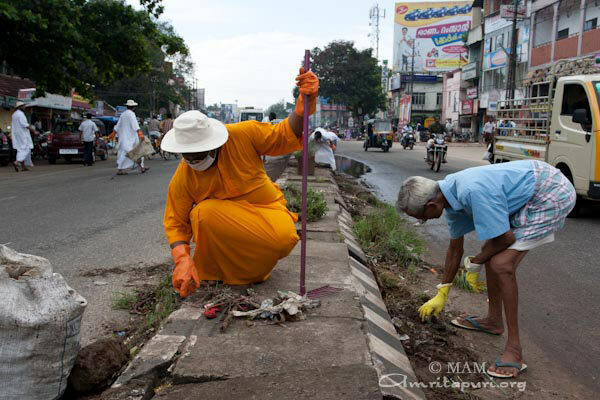 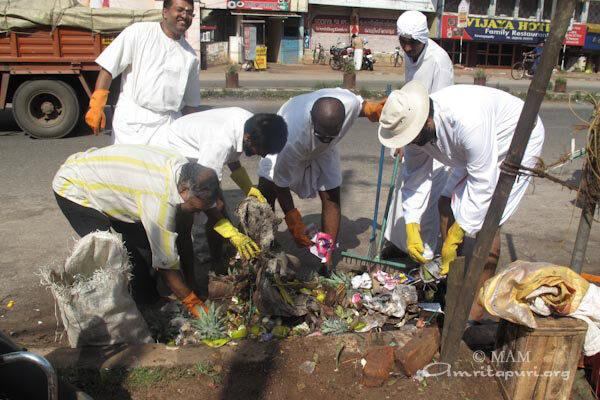 This is a part of the ongoing cleanup drive taken up by Mata Amritanandamayi Math (MAM) to realise Amma’s vision of a clean India. 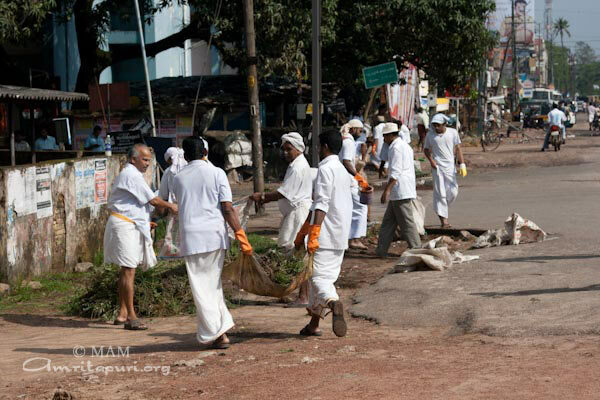 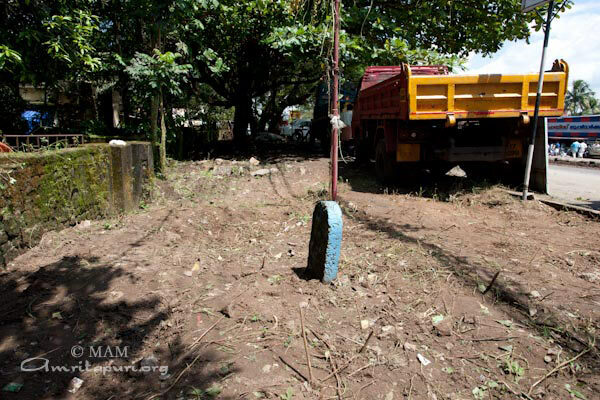 With this fourth phase of the cleanup drive, the Math has completed cleanup of roadside over a distance of 15kms, from Vallikkavu to Karunagappally. 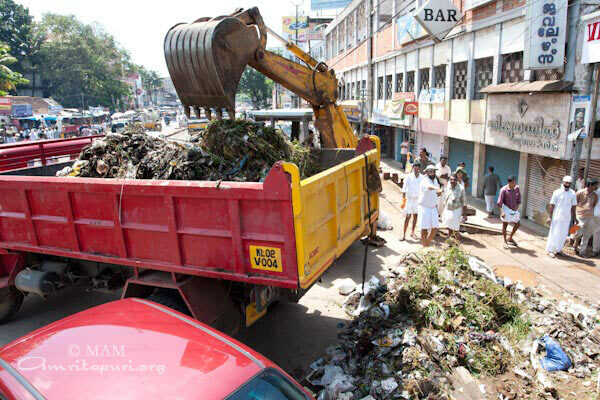 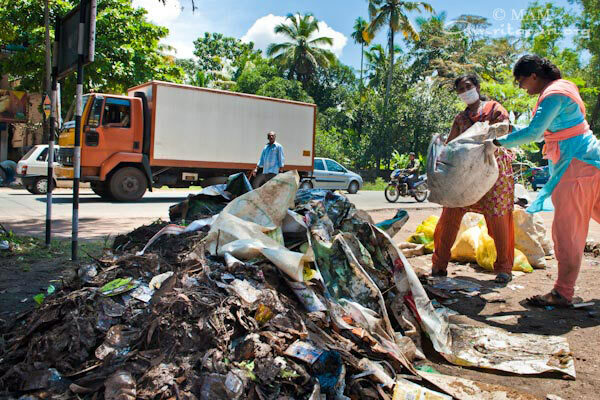 Two JCBs and four tipper trucks and two small pick vans were put to use throughout the day to clear garbage from both sides of the National Highway. 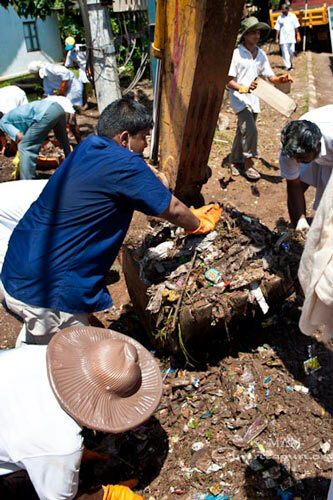 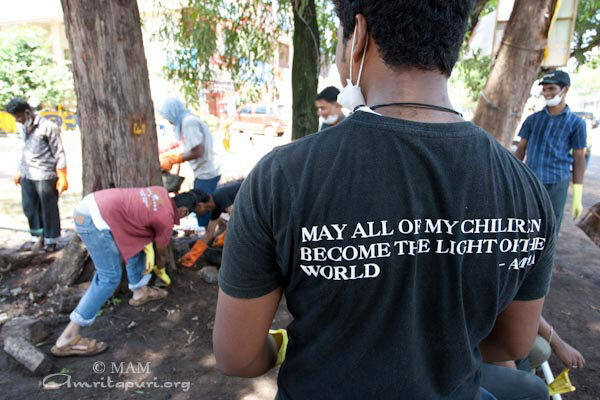 At several spots, volunteers had a hard time clearing garbage that had accumulated for months and years. 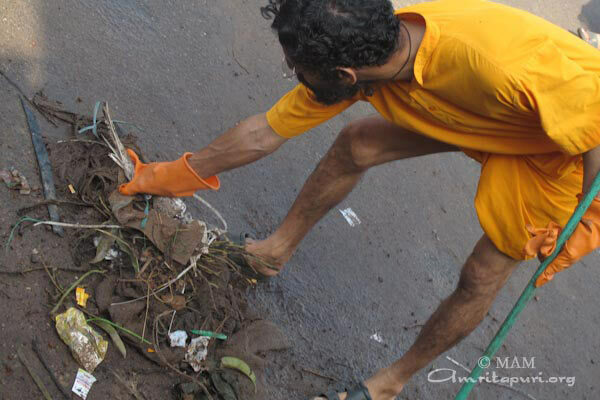 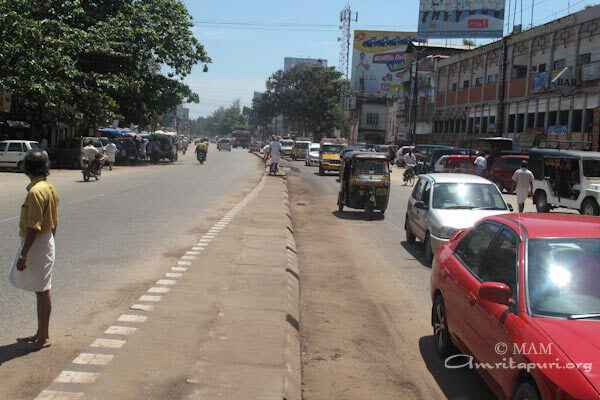 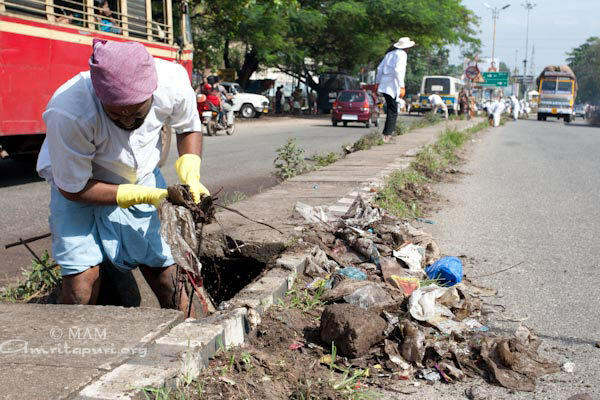 Some of the drainages were fully clogged on account of the accumulation of garbage in it. 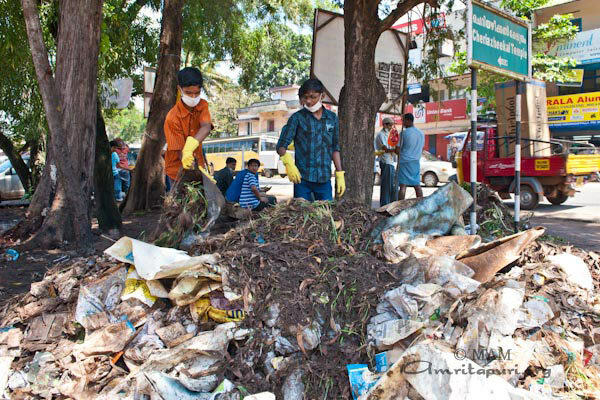 The cleanup drive that was originally planned till 1.00 pm had to be extended till 6.00 pm on account of huge amount of waste that had to be cleared. 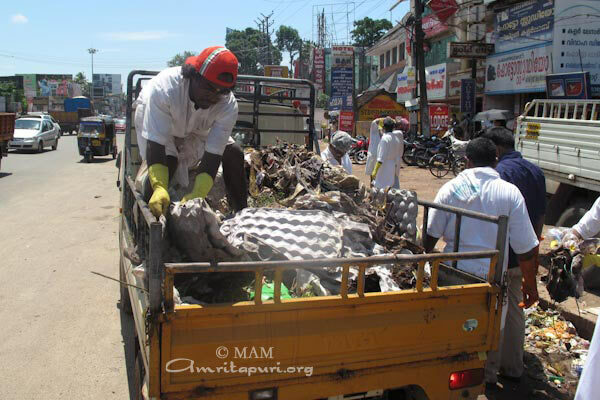 The waste was sorted into recyclable and non recyclable items before disposing non reusable waste. 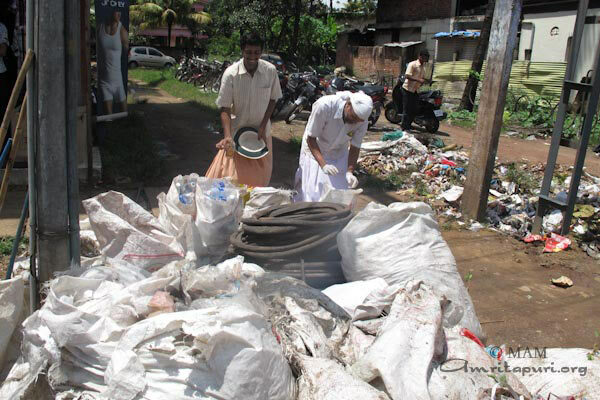 The recyclable items such as plastics were taken to recycling centers for further processing. 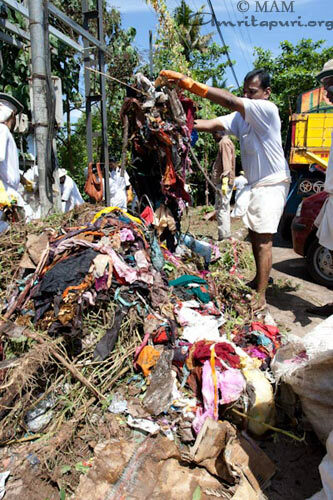 Nearly 25 truck loads of waste were transported and buried in the pits prepared for disposing the biodegradable waste. 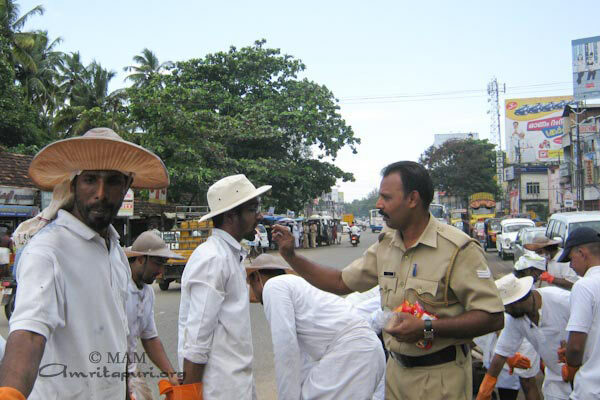 The local police under the leadership of Circle Inspector Gopakumar actively assisted in the cleanup drive by regulating the traffic. 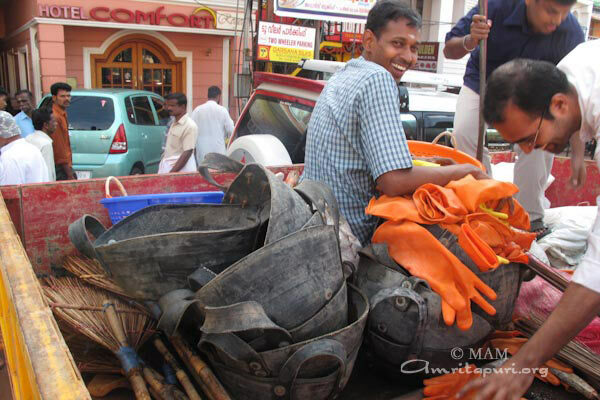 The police also made available equipments for digging pits and collection of garbage. 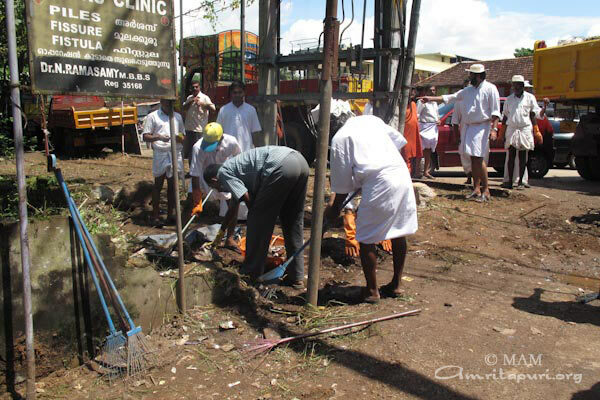 The cleanup operations captured the attention of passersby and local shopkeepers on account of the magnitude of the operations and the large number of people involved in the drive. 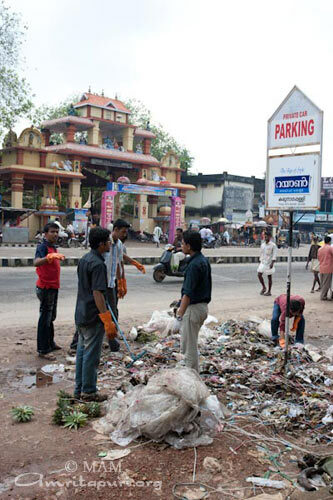 The town presented a noticeably clean look by the evening. 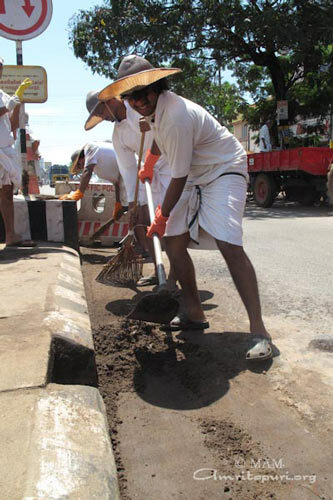 It is SOOOOO nice to se my brothers working so hard! 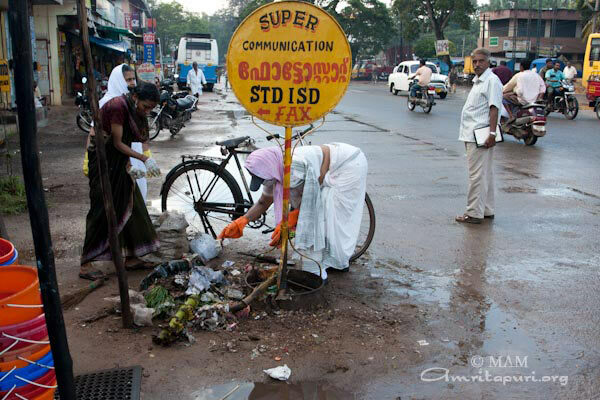 I really make my so happy ’cause the thing is, these morning i was walking on the street here in europe, and i saw a paper on the flor, i thought ” if u where in india, u would pik it up to clean the street as Amma says” but on the other side i thought ”anyway i’m not in india, and here no one cares and there is no one who piks up any thing from the floor”, so…. 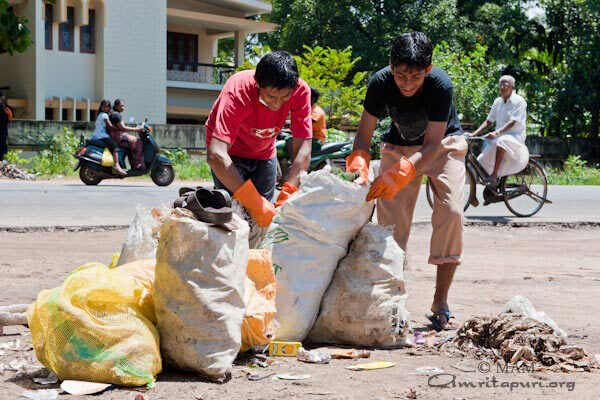 i followed the first thought ’cause even if it is only one person who starts helping the mother earth it is a little change:) AND THEN I WENT HOME AND I SO THESE BEAUTIFUL PHOTOS FROM MY BROTHERS AND SISTERS!!! 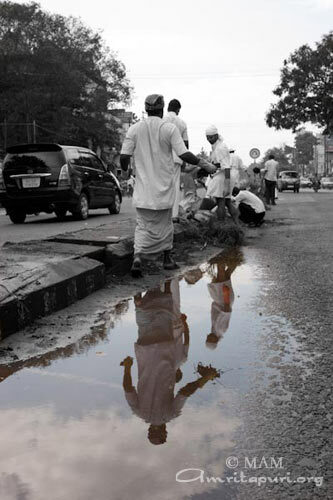 it rely make my heart happy, i dnt know who is going to read these, but THANKS for posting such a beautiful pictures.